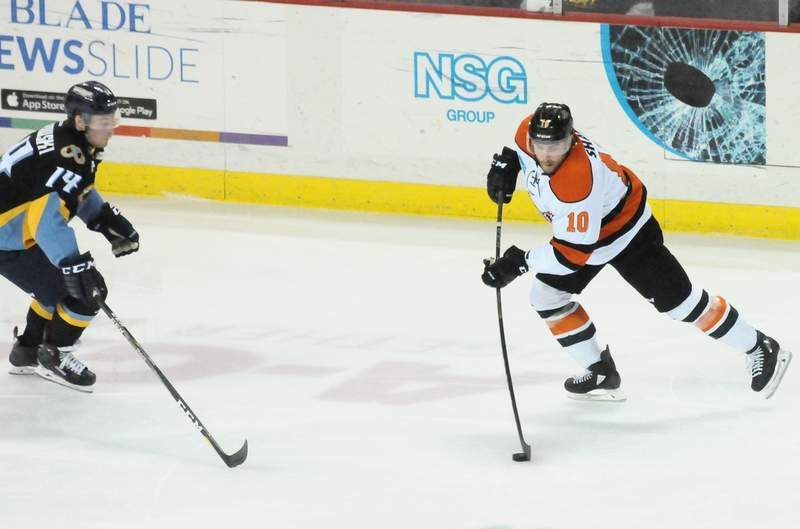 TOLEDO – Some might look at what transpired at the Huntington Center as a missed opportunity for the Komets. They had it tied, in hostile road territory, against a higher-seeded team in the third period Friday night. 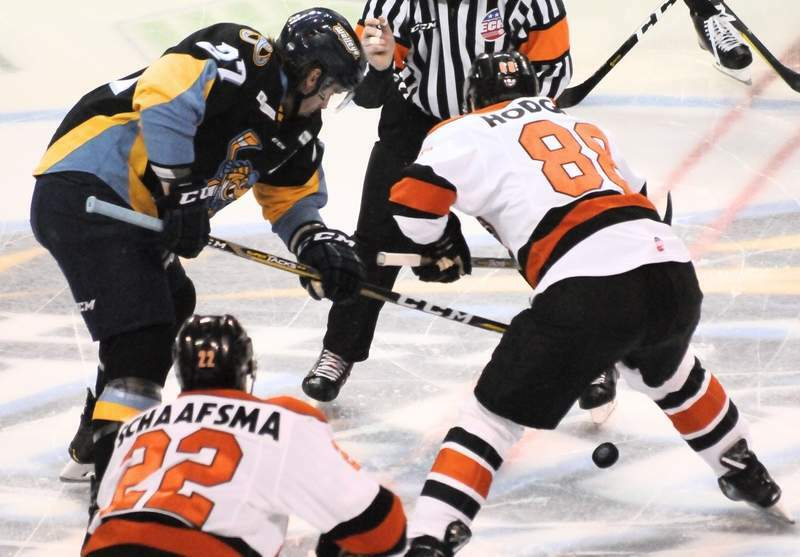 Even though they lost 3-2 – the game turning on goals by the Toledo Walleye's Bryan Moore and Greg Wolfe just 23 seconds apart – the Komets felt this was more something to build on than an opening game that got away in the Central Division semifinals. “I thought we played a really good game. We just had a couple mistakes in the third period there. They got two quick ones, which took away our momentum and we can't allow that,” said Fort Wayne's Shawn Szydlowski. Toledo's Pat Nagle stopped 28 shots. Fort Wayne's Zach Fucale stopped 35 shots in front of 6,163 fans. 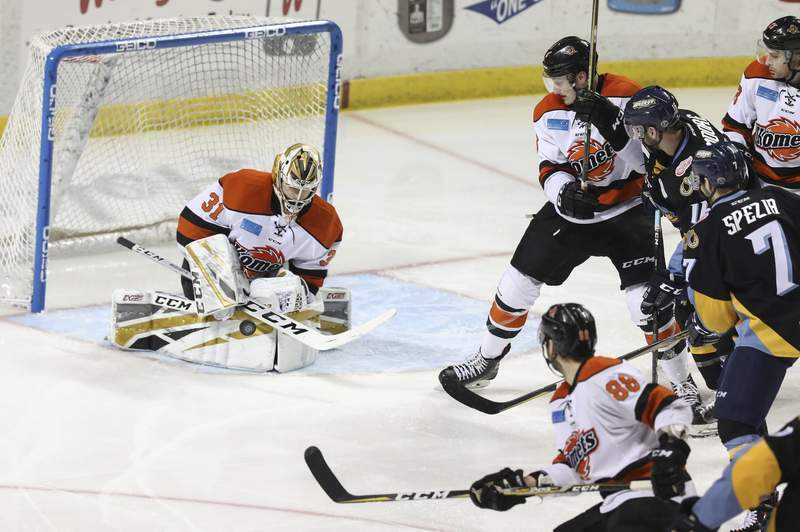 Toledo's third-period goals both came off turnovers at the offensive blue line – something that has dogged the Komets this season – and Fort Wayne coach Gary Graham would like that corrected for Game 2 of the best-of-7 series, 7:30 p.m. today. Fort Wayne had tied it at 1 when dump-and-chase hockey resulted in Cody Sol's 50-foot shot being redirected by Jake Kamrass 4:42 into the third period. Moore answered by blocking a Josh Elmes shot, then taking off on a 3-on-2 rush that saw him finish it with a goal at 9:26. The first two periods were marked by end-to-end action, missed opportunities and the feisty physical play one expects when these rivals engage. Toledo's first goal came from Matt Register, who was set up by Sadowy circling the net, 9:16 into the first period. There was a huge check by Toledo's Ben Storm on Mason Baptista; a fracas that saw A.J. Jenks cross-check Sydlowski and then get thrown to the ice by Baptista; a controversial penalty for unsportsmanlike conduct on Szydlowski for shooting the puck into the net after the first period ended; and shots by Toledo's Register and Ryan Obuchowski that hit posts. The Walleye's ability to excel after Kamrass had tied it, though, was pivotal. Notes: The referees were Andrew Bruggeman and Jacob Rekucki. ... Cincinnati's Jesse Schultz was selected ECHL MVP by coaches, reporters, broadcasters and team staffs.